The death of a former president or first lady typically brings together a good number of the others still living, though apparently not all of them this time around. As such former White House occupants as Rosalynn Carter, Nancy Reagan and George W. Bush pay their final respects to Betty Ford today in Palm Desert, California, others are not in attendance. In fact, no first couple is there together, thanks to the unexpected absence of one notable individual for seemingly absurd reason. Bill Clinton has been forced to miss today’s service, reportedly because of mechanical trouble with his plane out of New York. Really, I ask? A former president must fall victim to such inconveniences of the masses? Doesn’t his wife have some connections to get him another plane toute suite? Looks like it’s a good thing President Clinton was not on Mrs. Ford’s handpicked list of speakers at her eulogy. Good for her, by the way, for making such thoughtful and detailed preparations for this day. And good for her again, for including politics on this occasion. Mrs. Ford’s body will be flown tomorrow to Grand Rapids, Michigan, where she’ll be laid to rest alongside her husband, of course. Coincidentally, both of them lived to the same age of 93, President Ford passing away in December 2006. No age record for this first lady, however, as Bess Truman holds the title for living to 97, followed by runner-up Lady Bird Johnson who lived to 94. And no sooner did I mention on her 90th birthday last week that Nancy Reagan was not the oldest living first lady, than now she is! 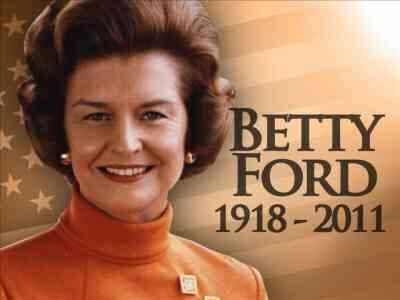 This ABC News piece presents a decent look back on Betty Ford’s life and legacy. To say the least, she was a unique and pioneering woman who certainly deserves to be remembered well.